I work from direct observation of the motif whether it is a still life, landscape or the figure. My work has been selected into over thirty national juried art competitions. 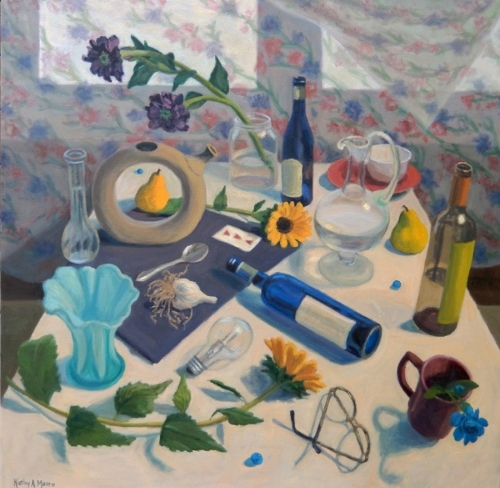 Many of the jurors for these competitions are renowned painters and artists who are members of the National Academy such as William Bailey, Paul Resika, Lois Dodd, Ruth Miller, Bernard Chaet, Barbara Grossman, Henry Finkelstein, and Gregory Amenoff. My painting was selected into the Blue Mountain Gallery in NYC for the 2016 National Juried Exhibition. The juror was Stanley Lewis (member of the National Academy). There were over 1000 works submitted and he selected 34 works for the exhibition. In 2015 my painting was selected into the Prince Street Gallery in NYC for the 7th National Juried Exhibition by juror and artist Robert Berlind. 790 works were submitted and 65 were selected for the show. I also had a drawing selected by juror Steven Harvey (NYC gallery owner) into the First Street Gallery in NYC for, Strange Paradise, 2015 National Juried Exhibition.